August means Summer holidays have officially started, and here in Nice we are all heading for the beach (I know, we should be working but ...). The city's daily newspaper, Nice Matin, recently ran a list of best beaches with the title, 'Dix coups de coeur'. So if you are flying to the Cote d'Azur this August, September, October (and even sometimes as late as November when we can be still swimming), here is the paper's list plus a couple of our own favourite picks. Most people know and love the golden sandy beach of Villefranche sur mer, but not many know about plage de la Darse next door. 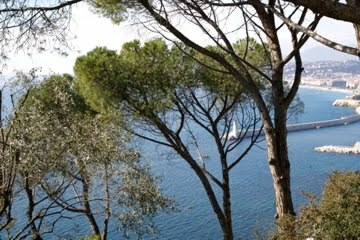 Behind the 'darse de Villefranche', it is frequented mainly by locals. Quiet, only a snack bar or two and not as accessible as its main rival (you need to park and then walk a while to get to it), it manages to keep itself secret. Between St Laurent du Var and Villeneuve Loubet is where you will find this sandy beach (a rare thing on this coastline) dedicated to families and children. There is a range of entertainment for the children and a large number of restaurants. And if the weather doesn't seem promising, Cap 3000 - an enormous shopping mall close by - is at hand. But that wouldn't happen on the Riviera! COTE ABODE'S PICK: If organised beach games is not your thing, Villefranche sur mer is a good choice for the family. A beautiful fishing village with a generous sandy(ish) beach. It's relaxed and unpretentious, but it also gets very busy in the season. Only the locals know about this stony beach according to Nice Matin newspaper. While that is not entirely true, it is tucked away between Monaco and Menton and access is again by foot only. The beach is renown for a small but important piece of architecture - Villa E1027, a summer-beach house designed by the modernist architect Eileen Gray in 1929, which boasts murals by her friend and frequent house-guest, the even more famous modernist architect, Le Corbusier. The crescent geography of this small bay gives the feeling of being on an island and offers protection from the wind. Rubbing shoulders with the exclusive Saint Jean Cap Ferrat crowd is a public part of the beach, which is well maintained. The sun is best in the morning/early afternoon. Nestled in a little cove, hidden by trees, the Mala beach is a natural haven. Access is by foot, down stone steps. The little beach huts dotted along the shore give the bay an authentic old-fashioned charm. There are two restaurants, L'Eden and La Réserve. A rocky path along the coast, favoured by fishermen, is a great place to take a stroll. COTE ABODE'S PICK: Coco Beach, Nice. Not really a beach, but a series of rocks that tumble down to the sea (making it unsuitable for small children), this 'sunbathing and diving post' is one of Nice's best-kept secrets. With only room for a a couple of dozen bodies, the locals take priority. You are really 'in the know' if you know this beach! A tiny stretch of sand and stones, this beach remains untouched by the glitz of the Riviera. There are no shower facilities, no snack-bars, restaurants or other distractions. Just the sea, beach and beauty of the surroundings. Access is down a 400m track. In a region renown for its eye-watering prices, including the private beaches and all their accoutrement, it is refreshing that Antibes has maintained a public beach in one of the best spots. For only 8 euros a day (5 euros for a half day) you can have access to an umbrella and beach bed. The down-side: the queue starts early in the day (9am) as there is room for 75 places only, and only two beach beds are allowed per person. 'The place to be' according to Nice Matin. If you like your beaches to have that Ibiza or Santa Monica vibe, then this is the one. DJs, jetsetters and wannabes crowd the beach (and pool) in what is described as a nightclub under the skies. COTE ABODE'S PICK: The Nice alternative is Hi Beach, brought to you by the people behind the uber-trendy Hi Hotel in the centre of the city. Expect Euro-kids and mojitos on-tap. Reserved for nudist sunbathing, this tiny rocky beach is difficult to find (There is a little path from the Basse-Corniche, between Saint-Laurent d'Eze and Cap' d'Ail.) A peaceful spot and no need for a bikini. These two beaches are especially equipped for the handicapped, including parking, a lifeguard and special helpers on duty, adapted showers/changing facilities, access ramp to the sea, special bathing chairs, etc. And all entirely free.